Romanov dynasty. Who are they? The main symbol of New Year in Russia – is Father Christmas (Ded Moroz). The first street rail transport, which appeared in St. Petersburg in 1860, was horse-drawn railway, in local parlance known as "Conca"(translation of the word "horse"). The first tram of St. Petersburg was invented and demonstrated in action by the engineer Pirotsky F.A. in August 22, 1880. Pirotsky made the moving tram car, equipped with an electric motor and supplied electricity across the rails. However, long-term contracts with the owners of “Conca” according to which the land of all of the main streets in the city was rented out to them hindered the emergence of trams on the streets of St.Petersburg . Only in 1885 the tramway tracks were maintained across the Neva river on the ice. "Ice" trams served in winter time and linked the city centre with Vasilevsky Island, Vyborg and Petrograd side. In 1902, when eventually the city government bought out the rights for the transport communication from the private owners the work of the best minds of Russia started on the project of the city tram. The project was prepared in 1904 and in the autumn of 1905 its implementation was started. American electrical company "Westinghouse" became the general contractor of the project. 190 carriages "Brush" were manufactured in Britain, 195 - at the Mytishchi and Kolomna plants in Russia. Putilov factory refitted horse-drawn carriages into the trams. 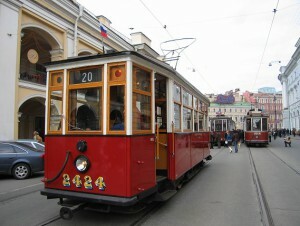 The opening of the St. Petersburg tram service was held in 1907 September, 29. Tram system immediately became the most popular kind of public transport. In 1908, the trams were transporting 230 thousand passengers along 9 routes. In 1911 the construction of the second tram line was started but because of the war since 1914 the process was gradually suspended in 1916. The Military Revolutionary period after 1917 became quite difficult for the tram services. At that time, in addition to its regular service transporting passengers trams also were transporting military supplies, food, fuel and others. After 1922 the new city government began the restoration of the tram network, carriages and opening of new tram parks. In 1928, 1000 carriages were operating daily along 274 km of the route. Three and a half million people used the tram daily in 1940. The length of the tramway tracks at that time reached 529 km. Since the beginning of the WW2 the rolling stock and equipment was actively used for military purposes like transportation of ammunition, food, soldiers. The production of military equipment, some spare parts for tanks and ammunition was started in some tram parks. Trams stopped operating on the 8th of December in 1941 due to electric power outage. Some carriages were dropped and remained on the streets for the whole winter time. The trams began their function again on the 15th of April 15 in 1942. During the Siege of Leningrad because of the bombardments and air raids tram service suffered heavy losses: 13% of tracks, 153 carriages were completely destroyed, 1065 cars were damaged and needed repair. The restoration of the tram parks was completed by 1947. Leningrad tram reached its peak in the 80th of the 20 century. In 1990, the city had 10 tram parks, 2200 carriages and the length of the tramway track was 700 km. It was possible to transport 950 million people in a year. In the 90th of the 20 century the construction of new tramway lines was stopped due to the shortage of money after the disitagration of the Soviet Union but however the tram park of Saint-Petersburg still remains one of the largest in the world.